The Manhattan skyline is one of New York's proudest possessions  at least that's how it always seemed to Tommy Flynn. 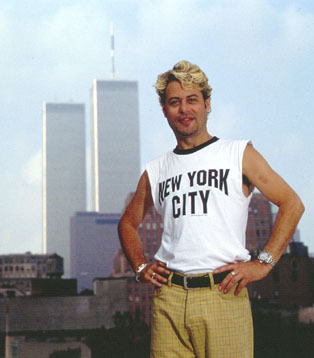 When he moved into his TriBeCa loft in 1986, Tommy fell in love with the view from his studio window. The towers of the World Trade Center stood a breathtaking 14 blocks away, and Tommy photographed them for over ten years. The architectural environs and the sky, combined with spectacular sunsets and dramatic weather changes, culminated in his seminal depiction of this urban icon through the skyline's kaleidoscope of change. The World Trade Center has seldom been shown to such a personal picturesque advantage. It is impossible to fully enumerate the many variations on the theme that Tommy has juxtaposed to delight the eye, just as it is hard to choose favorites among the many striking images. Each shot is so dynamically of itself, so clearly and deeply felt. Standouts for some are those in which he captures blissfully, almost brazenly blue daytime skies, with clouds that actually surround or even hide the buildings. Other favorites are those in which lightning is literally striking the antenna at the top of the north tower. One of Tommy's favorite colors is a deep resonant orange, and that color appears in six of the 36 photos, often as a brilliantly cloudy herald to night, or as a wrenchingly gorgeous farewell to sunset. These images are all products of the artist's prolific talent, his genius for having the camera at the ready when beauty strikes. One can guess at the time of day or the city's mood, and almost imagine that you are there with Tommy, watching the ever-changing view. Tommy Flynn's photographs put to rest forever the question of whether photography is art. It decidedly is when backed up by talent, imagination, and vision. Tommy's desire was to document the urban skyline as it miraculously changed its tone throughout days, seasons and years. He has succeeded beyond his own dreams, and is grateful to be able to share such a powerful document of the beauty of his beloved Manhattan skyline.